Gone are the days when a basic understanding of Microsoft Word and Excel were enough to get you through your ICT lessons in primary schools. According to Vicki Lewis, head mistress at Endon Hall Primary School in Stoke-on-Trent, “kids are growing up in a world where they need to learn how to communicate and work online”, and therein lies the problem as computers, laptops, tablets and other ICT equipment doesn’t come cheap. In order to fund such equipment schools often partly rely upon fundraising initiatives like PTAs to help them raise the cash. So, when Currys PC World offered us the chance to giveaway £20,000 to a school to spend on Microsoft tech we were over the moon. We set to work full of excitement, telling registered school causes that if they made a purchase online at Currys or PC World through easyfundraising.org.uk they’d be entered into the prize draw. The entries came in thick and fast but, as is the way with competitions, there could only be one winner. It was Endon Hall Primary School in Stoke-on-Trent that scooped the prize after PTA member and mum of two Endon Hall pupils, Jacqui Dawson, made her purchase. Having only 32 laptops between 221 children, they really couldn’t believe their luck, until our lovely Account Manager Tom took on the role of Fairy Godmother (or rather Godfather) and turned up at the school gates bearing one almighty cheque. 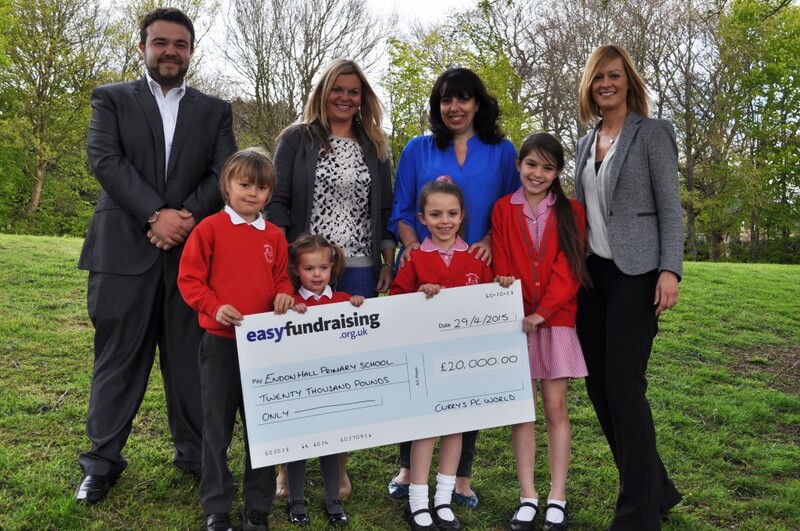 £20,000 would have taken them five years to raise through traditional fundraising methods, meaning that over 50% of the children currently in education there wouldn’t have benefited from the funds raised. We’re often on the hunt for ways to help registered causes raise more and seeing the difference it can make first hand only drives us further. Congratulations again to Endon Hall, we hope you enjoy spending your money. Make sure you’re not missing out on any of our great competitions; the difference it could make to your cause could be just as big! Like us on Facebook, follow us on Twitter and make sure you’re registered with easyfundraising.org.uk to get fantastic opportunities delivered straight to your inbox!